While we are still enjoying the rest of our summer here in the north, I know many of you are preparing for your children to go back to school (and some already have!). Let me know what your favorite back to school recipes are! *Prep/make Chicken Tzatziki Bowls on Sunday for Mon-Thurs lunch. You can also boil your eggs for Mon/Thurs breakfast, if desired. Absolutely using these plans!!! Please continue sharing! You are helping so many people towards their goals of eating better and maintaining a healthier lifestyle with your meal plans. Appreciate you more than you will ever know. Thank you! I love these meal plans with the grocery lists! It is really helping me to eat healthier. Do you have to print each recipe separately? Or is there someplace to get all of them in one swoop? Please continue! This is very helpful to keep track, delicious menus, and the shopping list is so handy. I love your web site. Keep up the good work. Love these! Makes following the program so much easier for me! Is anyone else having trouble getting the google doc to pull up? I like to print out the weekly view but it’s not working. I just ordered my groceries which are coming today and then I will get cooking. I am so excited to have a meal plan that includes family dinners. I was in a cooking rut so this makes it easy — and healthy! Love the meal plans!! They help me get organized and take out the guess work of planning. Thank you! Love your recipes, Gina! 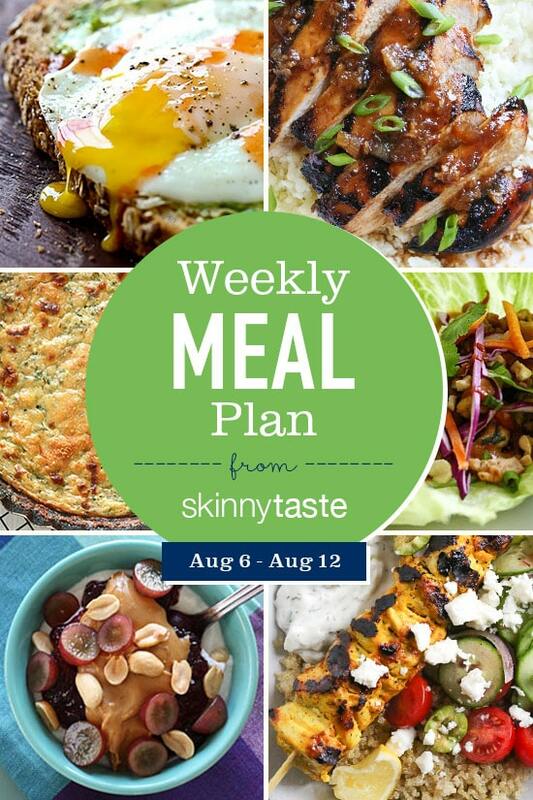 I did not know you were doing weekly meal plans… this will be a game-changer for me!! Looking at all of the other weekly plans you have done, I can see that it would take a lot of time to complete the meal plans and grocery list. Will definitely be using these! Thank you! Please keep doing what you are doing. I love your site, I have used the meal plans numerous times. My husband and kids love your recipes as well! Thank you for these weekly menus! I use the breakfast and lunch ideas the most but have found great dinner ideas as well. My hubby is a bit of a fussy eater. I’m finding that I need to have a meal plan for successful weight loss and your menus are working for me! Yes please keep up the meal plans, recipes and shopping lists! I just found these and am loving them! Thank you for all your hard work! Hi, Gina! Thanks for the AWESOME recipes! I’m just starting WW, and I’m so excited to use your menus. Do you have a favorite whole grain bread? Plan looks like it has both the structure & flexibility I need! THANKS for sharing your gifts with us! Thank you for the weekly planner. I have been using these to stay on my diet. This makes planning B, L, and Dinners so easy. I also love the shopping list and the calculator to keep me on track. I forward to these e-mails every week. Just came across your site. Love the meal plans. Haven’t started using them yet, but hope to do so soon. Thank you for creating this website! Love these meal plans! Please keep sharing!!! Thank you so much for the weekly meal plans! They are a huge help on my weight loss journey. Today I noticed the google doc has dinner Friday 8/11 as Korean Beef, but the website above says Salmon. Just an FYI. It looks like to google grocery list is for the salmon. Thank you, Gina! Please continue. I can’t tell you how encouraging I find your site. Just trying to menu plan at the beginning of my WW journey is causing me to feel defeated. Your plans and lists are so helpful and I am going to use so I can cook for the whole family. Thank you! Thank you! Please continue! These meal plans are so helpful! Definitely I am using your meal plans. I love the diverse menus and the inclusion of the grocery list is priceless to me. Thank you for sharing these menus and for listing the WW points. . I definitely use them . I shared them at my WW meeting this week. Can’t wait for your new cookbook. I recently found your website and am beginning to use these weekly meal plans and would love it if you continued to share them! Just ran across this website this week. We’ve tried three of the recipes and intend on trying to stick to the plan this coming week. Thanks for sharing the menus!! I am still using these. Thank you so much for compiling these menus, it really is so helpful! Yes, please continue making your weekly plans; I look forward to them each week and I use it as a guideline to menu plan. It gives me great ideas and I am loving your recipes. I have been using them all summer and they are all terrific and make me feel better knowing they are healthier.